Ingredients for making Lamb Kebabs This is another dish with a certain Greek style to it, although (as usual) I make no claims for authenticity. In a food processor, put a single thick slice of white bread cut into rough chunks. Process until you have fine breadcrumbs. To the bread, add a teaspoon of dried parsley, a teaspoon of dried oregano and two teaspoons of dried mint. Add some freshly-ground black pepper and a little salt. Process again until you have green breadcrumbs! Tip the breadcrumbs into a dish. In the same food processor (no need to wash it up! ), put half an onion, cut into chunks. Optionally, add a clove or two of garlic. Process for a few seconds, then add a pound of minced lamb. Process for ten seconds, then add the breadcrumbs. Process again until the mixture is a smooth meaty paste - scrape the sides down with a spatula a time or two to make sure all the ingredients are well-mixed. Form the meat mixture into eight or so long cylinders (think Plasticine!) and slide a skewer (bamboo ones are fine) down the centre of each one. Place in an oven-proof dish large enough so that they can all lay flat. In a jar with a tightly-fitting lid, put the juice of a lemon, two tablespoons of olive oil and a teaspoon of mint. Optionallly, add a teaspoon of soy sauce (not at all authentic, obviously!). Shake well to mix, then pour over the kebabs. Cover with clingfilm and stick in the fridge for a couple of hours to marinade. These kebabs could be cooked on the griddle or barbecue (the skewer down the centre makes this much easier) but I usually prefer to oven-cook them. Pre-heat the oven to Gas Mark 5 (180 C). Remove the clingfilm and stick the kebabs in the dish and marinade straight into the oven. 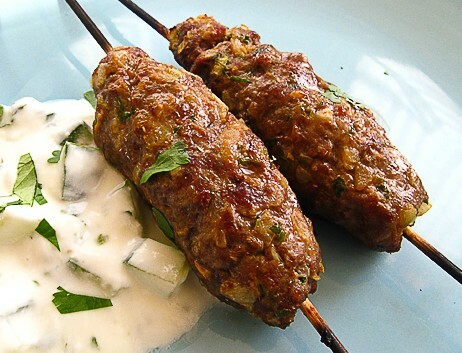 After half an hour, drain off the fat that has formed, and turn over each of the kebabs. Cook for another half an hour. Serve with rice, or pitta bread. Garnish with salad leaves and Tzatziki.